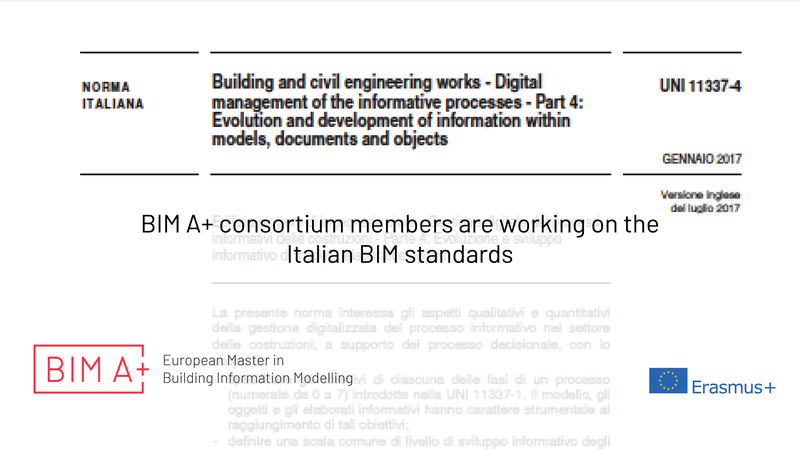 BIM A+ consortium members from Politecnico di Milano are working on the new Italian BIM standards. In 2015 after, the publication of BS PAS 1192-2:2013 (UK Technical Specification), Italy decided to print the UNI 11337-3 (BIM construction products attributes) and it started to rewrite its old part 1 developing a new set of structured standards (the part 2, object BIM classification, was not published during that time). Two years later, Italy approved the new UNI 11337:2017 (parts 1, 4, 5, 6). At the same time, the UNI working groups are still writing the future parts 2, 3, 8, 9 and 10 (ending at 2019). At the end of this year, the new part 7 will be published (actors and roles of BIM). In 2019, the UNI 11337 (like the BS PAS 1192 for the UK) will be the national annex of the international BIM standard ISO 19650 (parts 1 and 2).